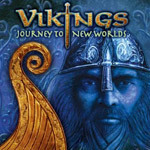 Offering a quick look at the Vikings and their early influence on world history, Vikings: Journey to New Worlds is an ambitious production originally presented in IMAX theatres and now available for home viewing. As it tells its tale of adventure, plundering, and conquest, Vikings manages to be both informative and fun to watch. In addition to the lush nature photography that is to be expected from a 40-minute IMAX production, this one also offers some reenactments of the assorted travels of Erik the Red following his 3-year banishment from Iceland. During that time, he discovered the beauty of Greenland. Later on, Erik’s son, Leif, would follow in his adventurous footsteps. The material here is, in some respects, reminiscent of a book entitled How the Irish Saved Civilization. Of course, the Vikings didn’t conquer the world by offering olive branches, but the contents here perform a service similar to that book on the Irish: the Vikings and their wanderlust are wrapped in an engaging, relevant and timely context. While the movie shatters the myth of Vikings in horned helmets wreaking havoc at every turn, it colorfully presents their influence on far-reaching territories from their homeland to Russia. Some of the special effects are a bit on the cheesy side, but given this film’s ambitions and its service as an educational tool, that’s forgivable. Overall this production is a slick, glossy look at a long-gone era. The disc is relatively sparse on supplemental features, but given the feature is a 40-minute IMAX film, what is here is good. “What’s here” is a 22-minute documentary about the making of the movie. It covers everything, including the casting, location shoots and on-set filming. The refreshing part is, since there are no “stars” in the movie, the documentary easily avoids the standard self-congratulatory claptrap and star-struck chitchat. The disc also includes the film’s theatrical trailer. The region-free DVD offers a beautiful anamorphic, high definition transfer from the original 70mm IMAX print. The sound is equally spectacular, particularly the English DTS track. Also available are Dolby Digital 5.1 tracks in English, French and Spanish, as well as English subtitles. Since the entire disc takes an hour to watch, it’s easy to cover it all. Start with the movie and, if you’re sufficiently impressed, head over to The Making of… documentary and trailer.